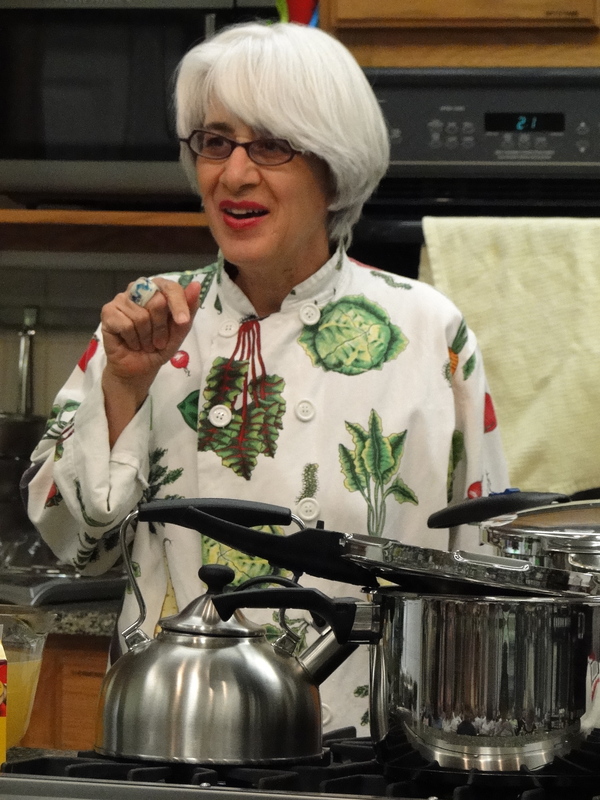 LORNA SASS is fondly known as “The Queen of Pressure Cooking.” She is also a widely published food writer and an award-winning author of 15 cookbooks. Lorna currently spends a good deal of her time as a Transformational Life Coach which has made her even more grateful to the “pc” for the fast, healthy meals it makes possible. This blog contains pressure cooker recipes and chronicles Lorna’s ongoing adventures with the “pc.” She invites you to contribute your own favorite recipes in the comments section of this blog. Lorna decided to write this blog because she thinks it’s sad that many Americans are still afraid of pressure cookers. She believes that the pressure cooker–which turns out soul-satisfying meals in 1/3 or less the normal cooking time–is the answer to getting healthy, flavor-packed food on the table quickly. Pressure cooking is not only time efficient, but fuel efficient as well–an important consideration in these days of trying to lower our carbon footprints. Family sagas of split pea soup on the ceiling are just that: stories from the past. The newly designed cookers are 100% safe! In the sealed pot, water boils at 242 degrees F instead of the standard 212F. At this higher-than-normal boiling point, the fibers in food break down in record time, turning inexpensive cuts of meat into meltingly tender forkfuls in a matter of minutes. The “pc” is also terrific for cooking dried beans (no pre-soaking necessary, whole grains (so good for you), and dense vegetables like potatoes and beets. Lorna became interested in pressure cooking during the mid-eighties after her vegetarian mother carted a cooker back from India and began producing delectable curries and dals in a matter of minutes. Realizing that the pressure cooker could produce “fast food” that was both nutritious and delicious, Lorna began culinary experiments that led to the publication of COOKING UNDER PRESSURE by William Morrow in 1989. Lorna followed COOKING UNDER PRESSURE with GREAT VEGETARIAN COOKING UNDER PRESSURE (actually vegan), and THE PRESSURED COOK. 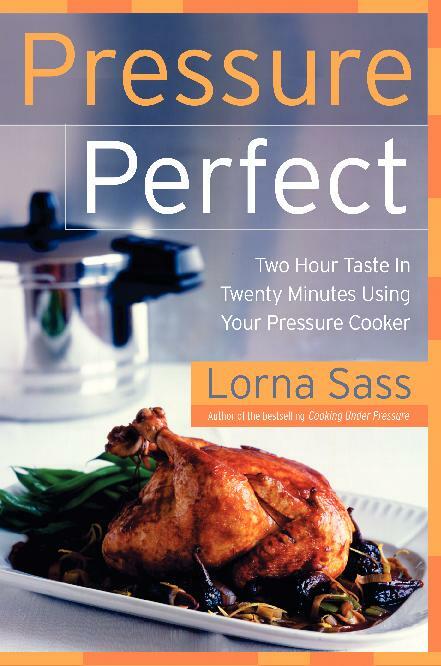 In 2005, William Morrow published Lorna’s PRESSURE PERFECT, her definitive work on pressure cooking. This latest volume contains over 200 recipes and divulges all of the cooking secrets Lorna has developed over almost two decades of cooking under pressure. For many years, Lorna was a vegan. During this time she wrote many vegan cookbooks, including RECIPES FROM AN ECOLOGICAL KITCHEN (now called LORNA SASS’ COMPLETE VEGETARIAN KITCHEN in the paperback edition), SHORT-CUT VEGAN, THE NEW SOY COOKBOOK, and THE NEW VEGAN COOKBOOK. Her fourteenth cookbook, WHOLE GRAINS EVERY DAY, EVERY WAY, was published by Clarkson Potter in November 2006 and was recently awarded the prestigious James Beard Award in the “healthy focus” category, reflecting her passion for an organic, health-promoting, sustainable way of eating. It is already in its third printing! She followed up with WHOLE GRAINS FOR BUSY PEOPLE. Lorna’s food articles have been published in dozens of newspapers and magazines, including The New York Times, The Washington Post, Gourmet, Bon Appetit, Prevention, Vegetarian Times, and Metropolitan Home. She blogs for the Huffington Post and Green Fork and has written a monthly food column for the newsletter of localharvest.org and essays for the TVFN web site. Lorna is a member of Slow Food, the NY Women’s Culinary Alliance, and the Women’s Leadership Forum. She is also an alumna of Les Dames des Escoffier, an organization of the top women in the food profession. For further information or to contact Lorna, visit www.lornasass.com. Your book Pressure Perfect has transformed the way my family eats. With busy schedules, we were eating more fast food, gaining weight, and teaching our daughter how not to eat healthy. I control the quality of ingredients and am able to nourish my family in the right way. Your recipes are easy to prepare and they taste fantastic. You made my day! Happy cooking. Last night my husband said “Lorna Sass’s cookbooks are my favourite” He loves cooking with the pressure cooker and he will make the Bean and Corn Chili from Short-cut Vegan(one of his favs) for supper tonight! I just printed your recipe for Southern Split Pea Soup with Ham. My split pea soup in the past has lacked something and has taken a long time to cook. I love using my pressure cooker and am so glad to find a split pea soup recipe that I can use. Thanks a bunch. I have not read your blog yet (but will!). I was cleaning out my cookbooks and came across a 1st Edition copy of Cooking Under Pressure. My step-dad (a wonderful man who passed away recently) loved to buy me cookbooks for my collection. I am devouring this book, literally!! I LOVE my pressure cookers and love, love, love this book!!!! I am cooking my way through it! Tonight…Potato Leek, tomorrow…Sweet Potato Beet! Next week…Porcupine Meatballs. I am very excited to find such a comprehensive book (in my own collection, no less). I am giving my mother in law a pressure cooker for Christmas, and will include a newer copy of your book with it! BTW, I own Kuhn-Rikon 4, 6 and 12 quart (lucky me!). So glad you’re having fun and eating well…and tx for taking the time to let me know! 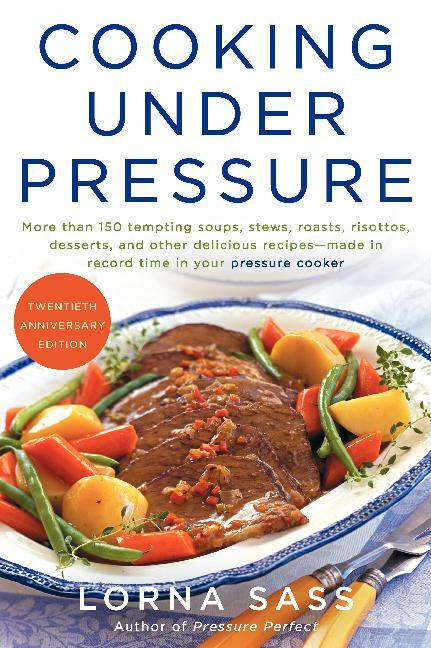 After you get through CUP, I recommend Pressure Perfect ,which represents my more recent explorations of the joys of pressure cooking. Was so excited when I came across your cook book on Amazon. It seems to fit perfectly with where and who we are as a family. We cook for 11, 4 of whom are elderly. My wife and I are greatly influenced by Drs. Esslestyn and McDougal so was thrilled to find a vegan pressure cooker book. Now our problem is trying to figure out which pc to buy. We’re on a pretty tight budget so not really thinking high end. After reading reviews I’m thinking about a Presto 16-qt, All-American 15.5-qt, or possibly Magefesa Star 12-qt. Any thoughts would be much appreciated. When you double or triple my recipes, experiment with using about 20% less liquid overall. Please let us know what cooker you end up with and if you like it. Happy cooking!